It seems airlines will stoop to anything in their pursuit of saving or making money. Long gone are the days of free food on bargain flights. Be prepared to pay to check even one bag. As if those skinflint ideas weren't enough, AirTran Airways (AAI) is placing ads on the backs of tray tables where travelers can't help but see them during takeoff and landing, as yet another way to haul in more revenue. As annoying, however, is that the discount carrier is actually "pleased to be able to offer exclusive deals and other promotions to our customers through this unique medium," said Tad Hutcheson, AirTran vice president of marketing and sales, in announcing the program Wednesday. The ads will appear in all 138 of the company's Boeing (BA) jets. This latest form of advertising adds to a full complement of revenue-rich resources already on board AirTran planes, including seat pocket advertising, advertising on catering items such as napkins and flight attendant announcements, the company said. The new ads measure about 2 1/2 by 9 inches and are placed at eye level, making them unavoidable to passengers unless the tray table is lowered. That of course can't be done during takeoff or landing, lest you attract the scolding glance of a displeased flight attendant. AirTran estimates that the ads will be "fully visible" for "40 minutes to several hours depending on the length of the flight ... offering companies a unique opportunity to reach consumers." AirTran isn't the first to experiment with in-flight ads, but the Los Angeles Times notes that it is the first American airline to put ads on back of every seat in its fleet. The messages are placed in a clear holder, making them easy to swap, as needed, AirTran said. Ireland's Ryanair and England-based EasyJet have already tested seat-back ads, while US Airways (LCC) places ads on top of tray tables, but not in every instance nor on every plane. The first ads, which will be unveiled on AirTran flights over the next two weeks, are from the Mother Nature Network, an online news and information site about environmental issues, which is promoting itself by offering a chance to win a seven-night trip aboard Royal Caribbean Cruises (RCL). Mother Nature Network CEO Joel Babbit said the new seat back placement idea, combined with wireless Internet service available on AirTran flights, will allow passengers to instantly go online and register for the contest. "We felt that the combination of them being an innovative airline with a new concept was perfect for us," Babbitt told the Times. The concept was developed by Atlanta-based OnBoard Media Group and is used by more than 10 airlines worldwide. The idea required Federal Aviation Administration approval. 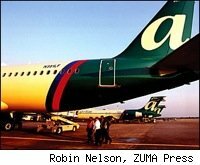 For travelers who fear the ads are just one more intrusion into an already ad-ridden form of transportation, AirTran's Hutcheson offered this: "We have gone to great lengths to present these advertisements in a tasteful, unobtrusive way that we believe customers will enjoy." No word yet on when time-share presentations will debut in airplane lavatories. That bastion of semi-privacy may represent the last ad-free zone, at least when it comes to air travel.